ONLINE REGISTRATION HAS CLOSED, Sign up will be available on site! Please note that due to lack of natural snow on our nordic trails, we have cancelled our Langlauf Nordic Race for Saturday, February 3rd. Nordic free skiing on Sunday will be weather dependent but there is snow in the forecast! All other events will continue as planned. 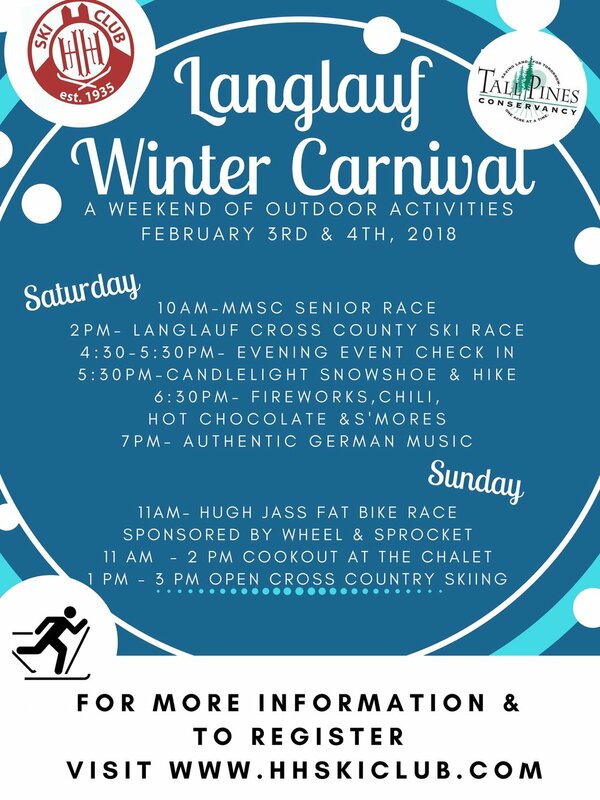 Join us for a day of outdoor activities at the Hill starting with the MMSC Racing Event, the Langlauf Cross Country Race (CANCELLED DUE TO LACK OF SNOW ON OUR NORDIC TRAILS) and a Candlelight Hike with festivities in the Chalet to follow. All events are open to non- members and interested participants should sign up online using the link below. You may sign up for all events using one registration form, but all participants including youth will need their own registration form. HH will also be offering guest downhill skiing for Saturday and Sunday for $20 each day. Interested participants should use the registration link or check in at the Hill office at the event.